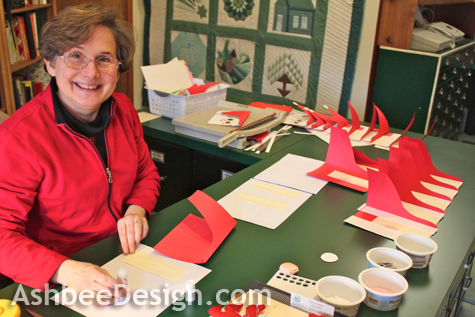 I have been making my Christmas Cards by hand for over three decades and I find it a wonderful tradition. 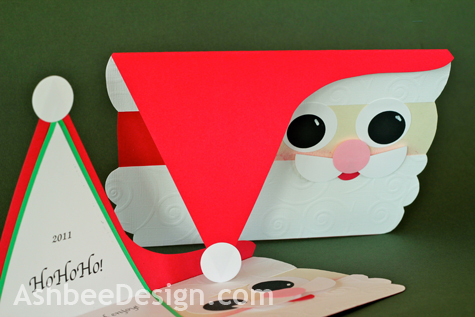 Here is the card I crafted and sent in 2011. 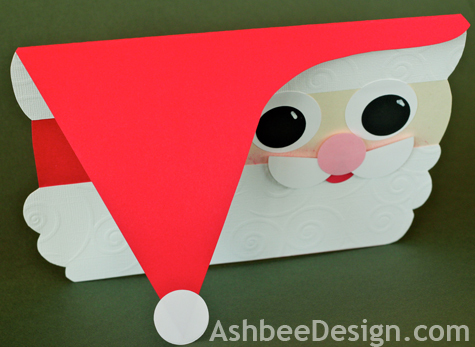 It is based on a classic Santa but his hat flips up and under the hat is the holiday message. I posted about the design inspiration here back in 2011 but I didn't post the tutorial. 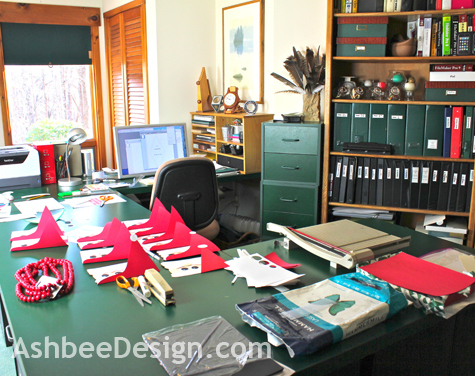 I collect ideas all year long, I work on techniques and designs in November and I spend quiet moments during a very hectic December crafting them. It is during this time that I listen to Christmas music, sip at wine, and remember all the special people on my card list. It is a thoughtful time, filled with memories. One might think it would add to the hectic holidays but in fact, I find it brings a little sanity and a lot of meaning back into a busy time. I only started blogging in January of 2011 and ran into a conflict in December of 2011. 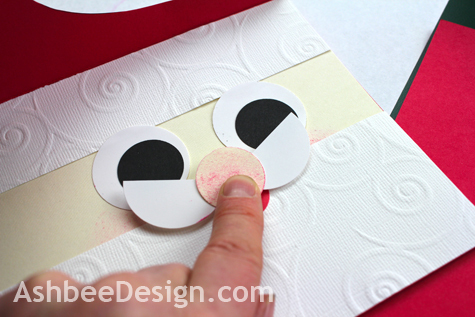 I wanted to share my Christmas Card tutorial with you in time for you to possibly use it to make your own. But, many of those on my Christmas Card list also read my blog. I didn't want to spoil their Christmas surprise by showing the card before they opened theirs. 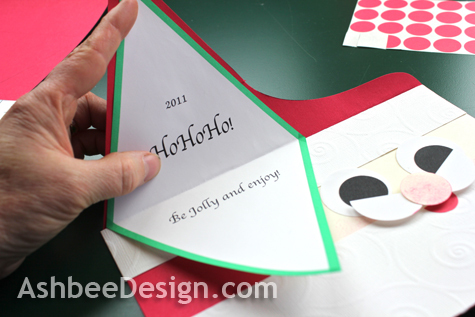 My solution was to wait and in 2012 show you the tutorial for my 2011 card. I did show the finished design after my friends and family received theirs. I have waited a full year before sharing these tutorial photos! I plan to do the same with my 2012 card. The tutorial will be posted in November of 2013! 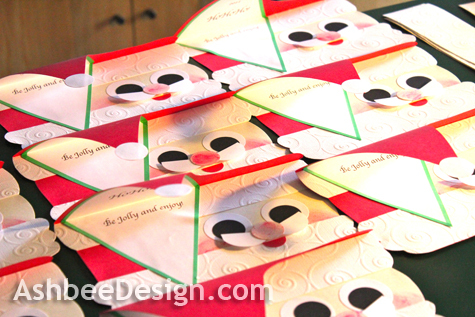 I make between 65-75 cards each year so I do a mini production line. I generally work in groups of 10, repeating each step 10 times and then moving to the next. Doing a single task 70 times in a row can be too repetitive! My desk becomes the main production line. Cut rectangles from the embossed white stock. 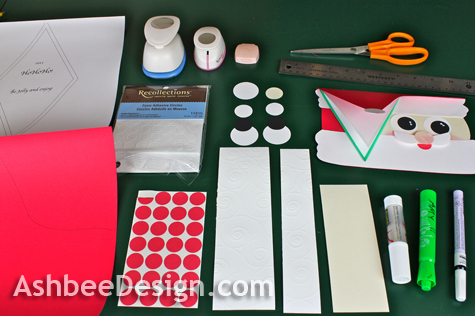 Trace the hat template on to an 8 1/2" x 11" sheet of red card stock. 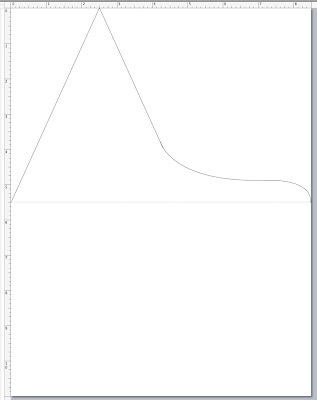 Below is the diagram for you to create a template from. It is on an 8.5 x 11" sheet of card stock. Cut it out and folded it in half. 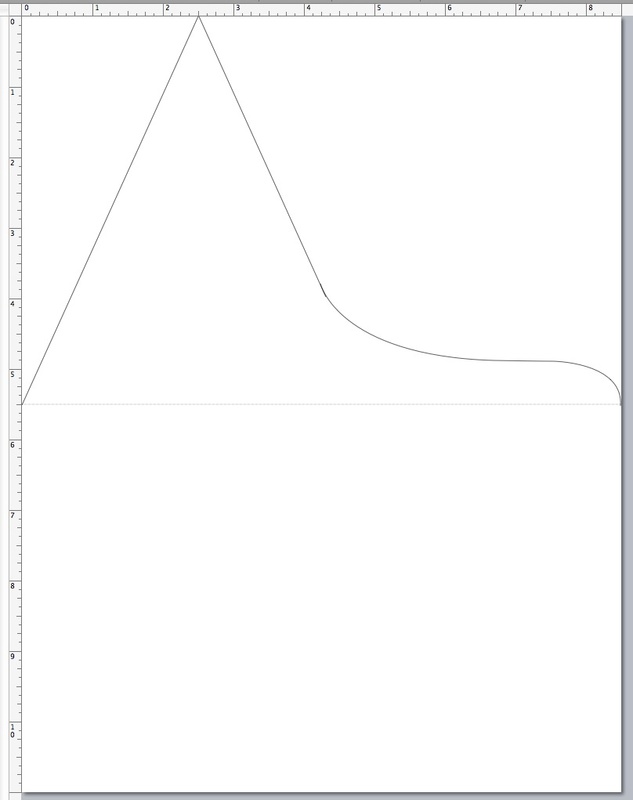 Note: This design is set up to fit in a 6 x 9" envelope. 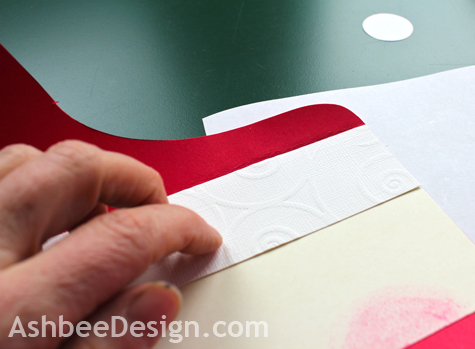 It is always important to design with a standard envelope in mind. 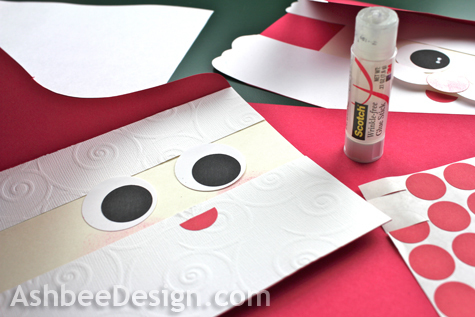 Glue the buff strip in place of Santa's face. 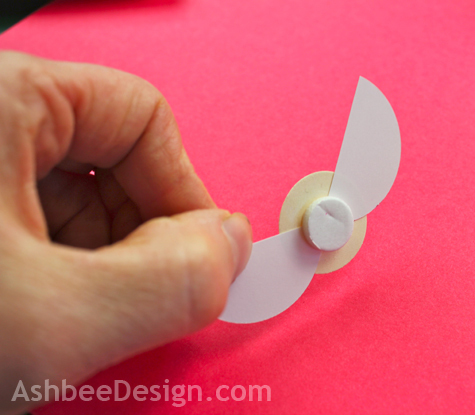 Use a wrinkle free paper glue stick. 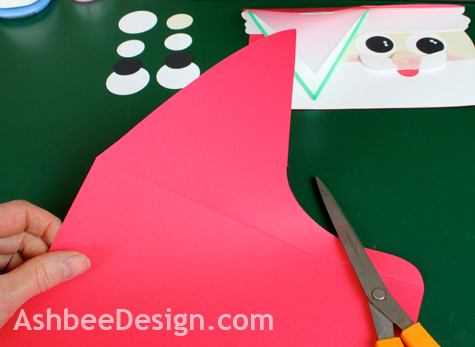 Glue a pre-cut rectangle of embossed white paper along the top of the buff cheeks to be the fur on Santa's hat. Make the circles noted in the supply list above. 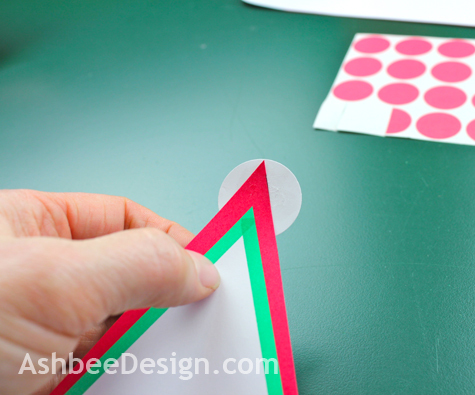 I used circle pinches which saved time but if you are only making a few cards you can certainly cut them by hand. 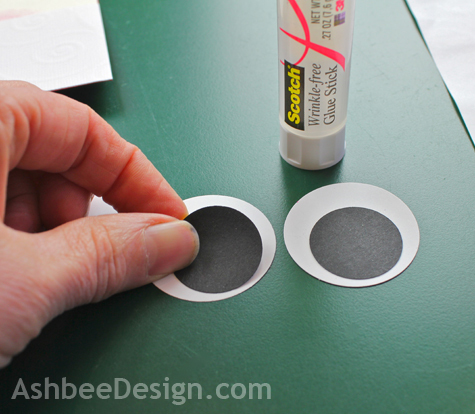 Glue 1" black circles inside the 1.5" white circle. Glue the eyes in place. Cut an Avery Sticker in half and apply as the mouth. Put together the nose piece. Cut a 1.5" white circle in half. 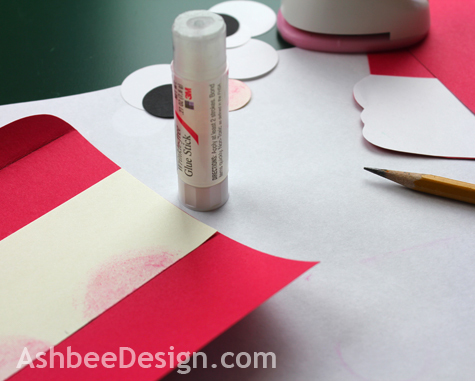 Glue each half on the back side of the 1" nose circle. Put a "peel and stick" foam circle on the back of it. Stick the nose and mustache piece in place. Create the insides on white paper. For the inside of the hat, I created a file on my computer that I could print up and paste inside. It took a little trial and error to get the spacing correct. My message always includes the year because many people keep a collection of my cards. Cut the diamond for inside the hat on the paper cutter. 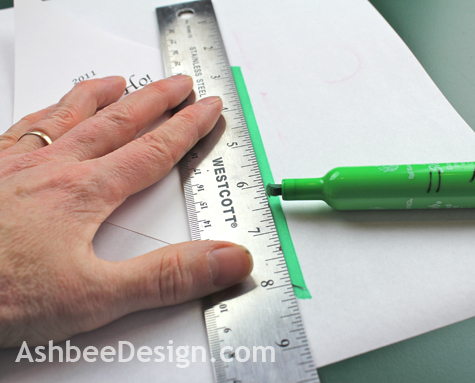 Using a green maker and ruler, trace the edges of the inner message diamond. I do this for color contrast. Glue the white message paper inside the hat using wrinkle free glue. If you are going to make a bunch of cards, put on the music, get some cocoa ( or wine) and get to work. I sometimes even where my reindeer antlers. It always adds to my Christmas spirit. 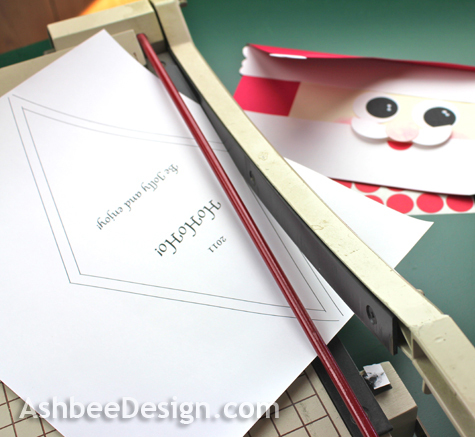 Now it is time for me to put some serious time into a design for Christmas 2012! This will be my last tutorial before Thanksgiving. Tomorrow guests start arriving for our dinner for 22 on Thursday. During the next few days I will post a variety of ideas I've collected that are my inspirations for Christmas decorating this year . And hopefully I'll start my ornament design as well. Busy, family times ahead. And how about a Santa hat as well? A 2" punch would work for the mustache- just a bigger mustache. 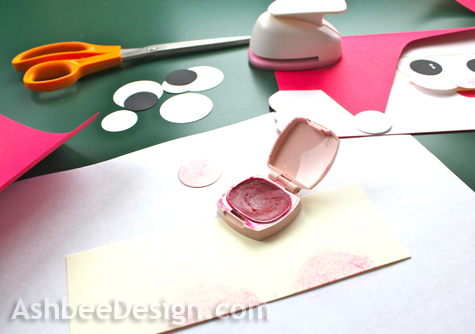 I think it would be too much for the whites of the eyes - but a 1.5 inch circle isn't that hard to cut by hand. The smaller circles are. I'd just cut the large ones by hand and use a punch for the small ones. Hints for Holiday Entertaining • Balloons? Tomte Ideas - Can I make my own? Pressed Leaves and Candles • A Pillar "Cuff"